On Tuesday in Western Pennsylvania, a novice candidate, a 33-year-old Democrat who had never before run for office, upset an experienced politician who President Donald Trump, Ivanka Trump and Donald Trump Jr. all stumped for and who received more than $10 million from dark money groups and the Republican Party. Not only that, the rookie did it in a congressional district that was gerrymandered to elect Republicans for life, a district that went for Trump, Mitt Romney and John McCain. Democrat Conor Lamb defeated Republican Rick Saccone in Pennsylvania’s 18th District, which had sent a Republican to Congress for the past 15 years. The shocker resulted from a winning combination. Organized labor worked for the candidate who pledged to work for labor. That candidate, of course, was Conor Lamb. Lamb did not view unions as boogeymen to fear and run from. He saw them as friends to run and win with. In his victory speech, Lamb acknowledged the role organized labor played in putting him some 600 votes over the top in a district that had gone for Trump by 20 points. Lamb said organized labor “was the heart and soul” of his campaign and he would not forget it. “Side by side with us at each step of the way were the men and women in organized labor,” he said. Lamb’s win illustrates that the manufacturing middle of the country and working class voters who went for Trump nationwide do not belong to him or to Republicans. They can be won by labor-supporting Democrats backed by grassroots and union activists despite $10 million in dark money and high-paid political consultants. They can be won by a candidate who workers trust to fight for issues critical to them. They can be won over to a candidate by face-to-face conversations with active and retired members of their own union. Hundreds of labor union members did that in Western Pennsylvania for Lamb. They went door-to-door, visiting tens of thousands of homes in the 18th District, to urge fellow union members to vote for Lamb. They phone banked. They rallied. In the week before the election, hundreds of United Steelworkers, United Mine Workers of America and Carpenters attended three rallies for Lamb, including one that featured former Vice President Joe Biden who said Lamb would “throw himself in front of a train” to protect the working class from Republican-backed plans to cut Social Security, Medicare and Medicaid. Saccone, who ran in a district dense with labor union members, is about as far away from labor as it’s possible to get. As a state lawmaker, he voted in favor of perversely named right-to-work legislation that assures no right to work but instead ensures employees will work for less money and unions will suffer a financial hit. And Saccone was endorsed by the Pennsylvania Right to Work PAC. Saccone voted against an infrastructure bill that would have provided jobs. He opposed extending unemployment compensation, which many workers in the 18th District needed during the Great Recession. Saccone bragged that he was “Trump before Trump was Trump.” And the President visited the district twice to rally for Saccone. But hugging Trump wasn’t enough to persuade workers in the 18th District that Saccone was their man. That is because labor, including members of the USW, the UMWA, the Service Employees International Union (SEIU), the Laborers International Union (LIUNA), the pipefitters, the building trades, the painters (IUPAT), the teachers, the carpenters and other unions, in addition to the AFL-CIO, visited or called nearly every one of the more than 80,000 households in the district belonging to union members registered to vote. Volunteer activists from the Steelworkers contacted every one of the more than 17,000 registered voters who live in USW households in the 18th District. Those face-to-face interactions between fellow union members were highly effective. They trusted each other in a way not possible when a homeowner is confronted by a stranger at the door with campaign literature. Even early on, in the chill of January, members of the USW began reporting enthusiasm in the suburban neighborhoods, mill towns and coal communities. More than one told of homeowners who chased them down the sidewalk to get literature and talk about Lamb. It was the same enthusiasm that USW volunteers noted when they went door-to-door in deep-red Alabama for Democratic U.S. Senate candidate Doug Jones, who is the son of a Steelworker and worked in a steel mill while in college. Jones won. The fact that Lamb was a, shall we say, dyed-in-the-wool union supporter helped tremendously. He talked about it at every rally, every Lenten fried fish dinner, every fund raiser. He told the story of his aunt, who belonged to St. Anne’s parish, south of Pittsburgh in Castle Shannon, where the priest for a decade had been Monsignor Owen Rice, known as Pittsburgh’s labor priest. The monsignor placed in the church yard a statue of Philip Murray, who was a member of the parish but who also launched the Steelworkers Organizing Committee, which would later become the USW. Murray was the first USW president. “In western Pennsylvania, it’s no surprise that we put a statue of one of our great labor leaders right there in the churchyard for everyone to see, forever,” he said at an event in January. 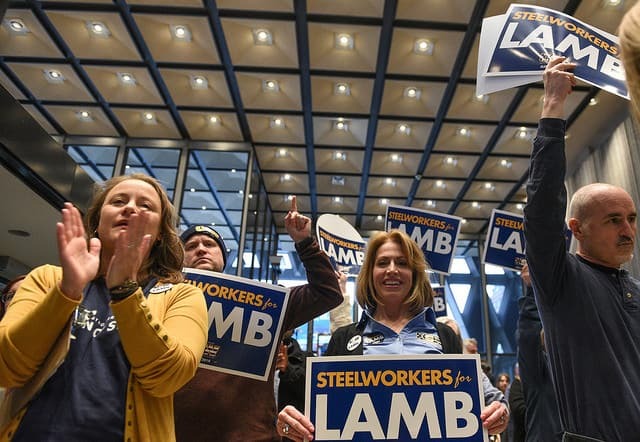 Lamb’s priorities are labor’s priorities, including supporting a federal infrastructure bill, pushing legislation to buttress coal miners’ underfunded pensions, and defending workers’ right to organize and collectively bargain for better pay and working conditions. UMWA President Cecil Roberts expressed union support for Lamb in the best manner at a rally Sunday in Greene County, located in the southwest corner of Pennsylvania, bordering West Virginia and Ohio. “He’s a God-fearing, union-supporting, gun-owning, job-protecting, pension-defending, Social Security-believing, healthcare believing, sending-drug-dealers-to-jail Democrat,” the labor leader said of Lamb, a former federal prosecutor and Marine. That is the kind of Democrat that workers and organized labor volunteers will gladly spend hundreds of hours walking door-to-door to support. And that block-walking and door-knocking clearly can make the crucial 600-vote difference between winning and losing in a long-time Republican district.